Well, this week I am finally able to wrap up this three-part miniseries on my journey to the MCSE: Communication. Consequently, in the process of pursuing my MCSE: Communication, I also achieved the MCSA: Office 365 simultaneously upon finishing my last exam on Wednesday, the 70-347 exam. 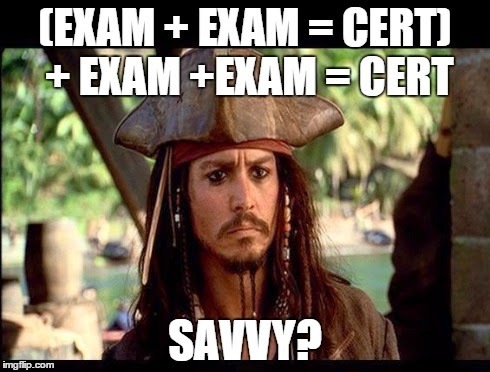 While I have covered the exam path options pretty thoroughly in the previous posts of this series, I will do a brief recap. On Microsoft's site, they show that the first two exams in this path are 70-346 and 70-347, which are both Office 365 exams (and as such, cover Lync Online). 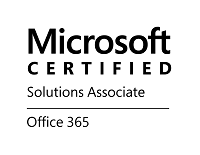 Upon completing both of these exams, you would have achieved your MCSA: Office 365 before achieving the MCSE: Communication, which would have been a product of the final two exams: 70-336 and 70-337. However, I went backwards, obtaining the Lync-specific exams first. Once I had these, I didn't posses any particular cert, and had to pursue the Office 365 ones next. This is how I ended up getting both certs upon completing that one last exam. As mentioned in the previous articles, MCITP holders should also be able to pursue the 70-417 in addition to the Lync exams, in leui of the MCSA: Office 365 exams. My personal recommendation, especially if you are interested in UC and the growing presence of Office 365, is to go the route that I ended up opting for. So, up to this point, I have given exam tips and preparation suggestions for the other 3 exams. The last one, 70-347, won't differ too much from my suggestion for 70-346 here. As with 70-346, make sure you hit up the pertinent Technet and Office 365 Support sites thoroughly, and continue to reference them throughout testing and use of other materials, like books. Once again, THE MOST helpful thing I can recommend to prepare for this exam is to purchase an Office 365 Business Essentials license at a minimum ($6/month for a single-user license), and get as intimately familiar with the Office 365 Admin Center as you can. In the case of 70-347, don't only get familiar with the Office 365 Admin Center, but also get very familiar with each admin center for each product, like the admin centers for Lync Online and Exchange Online. Really spend a lot of time exploring all your options within SharePoint Online as well. All of this is critical to achieving familiarity with the product, and understanding what is being asked of you on exam questions. Also, I am going to strongly recommend the 70-347 CBTNugget series: https://www.cbtnuggets.com/it-training/microsoft-office-365-70-347. This series is only 4 hours total, and each nugget is very short (usually only a few minutes). It is a great way to focus in on certain aspects, and really get to know them and the procedures. Finally the Microsoft Press Store Exam Ref for this exam is not due out until September of 2015, so if you are testing before them, sorry. If you are discovering this blog after that, though, please consider looking into this book as another good tool for exam preparation: http://www.amazon.com/Exam-70-347-Enabling-Office-Services/dp/1509300678/ref=sr_1_4?ie=UTF8&qid=1429890800&sr=8-4&keywords=70-347. 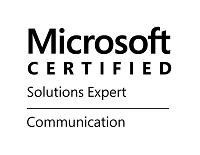 I am glad to have all that studying and testing behind me, and thrilled to now be a member of the MCSE: Communication community (as well as the MCSA: Office 365 community). I hope this series has been helpful to those of you wishing to pursue the same certifications, and I wish you the best of luck on your testing. The weekend is upon us, and I am ready to celebrate!